Just an absolute riot! 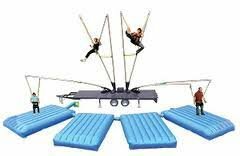 This award-winning Extreme Air In Line Air Jumper allows participants to soar high in the air up to 25 feet. You can perform backflips and other extreme air tricks! As opposed to other "Bungee" type models, ours utilizes fiberglass poles instead, which provides an extremely safe experience. Our Inline also has a larger surface area to perform your maneuvers on; you are not confined to a small space!